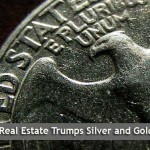 To Solomon’s list of things that are better than silver and gold, we can add real estate. Specifically, real estate of the rental variety, as Jason Hartman recommends. While precious metals come and go, real estate endures – and it’s one asset that continues to yield returns over time, if you hold on to it. Silver and gold top the list of investable precious metals, followed by platinum, palladium and other, “lesser” metals used mainly for industrial purposes. They aren’t all valued equally, though they share the glamour associated with their name. Gold, the perennial standard of banks worldwide, is the king of precious metals, bought and sold for hundreds of dollars, depending on the state of the market. More widely used silver comes in a distant second, selling for prices as low as $17 or as high as nearly $100. Successful investing in these metals depends on watching the markets, where the old adage “buy low, sell high,” clearly applies. But even if an an investor buys low, it can take a while to get the chance to sell high – and those factors really aren’t within that investor’s control. And, as real estate experts point out, what happens when an investor sells a quantity of gold, silver or other metals? If they’ve been watching the market carefully, they’ll get a considerable return. But that’s all. In order to make more money from investing in precious metals, that investor is going to have to either invest the money elsewhere or use it to buy more gold or silver and hope the market supports a sale that yields another decent return. While it’s possible to make a lot of money from buying and selling those precious metals like this, their potential for yielding regular returns over time is pretty limited. Is that really investing? Jason Hartman doesn’t think so. Real estate, on the other hand, does keep on returning a profit – and you don’t need to sell it to realize one. In fact, doing the opposite – holding on to that real estate purchase – is what allows income property investors to keep on realizing a return from their investment year after year. The well-publicized housing market crash of a few years ago put real estate in the spotlight. The crash revealed serious problems with mortgage lending and other flaws in the system that led to millions of foreclosures and a flurry of legislative actions to try to get the housing market and the economy back on track. The news in the years that followed presented a dismal landscape that offered few opportunities for homebuyers of any kind. But market shifts notwithstanding, people will always need places to live. And as home ownership declined, rental markets began to heat up, creating new opportunities for investors able to get financing for their properties. That lets an investor take advantage of what’s called “good debt.” A mortgage, ideally long term and fixed rate, lets you use other people’s money to build wealth. If you’ve invested wisely In the kind of property that costs little but yields big in terms of rental income, your tenants foot the bill for that mortgage each month while your own savings stay available for other needs. You can’t say that about precious metals. Though you might borrow to finance your investment, there won’t be a regular rental on your gold that will produce an income. In terms of taxes, real estate is the gift that keeps on giving, year after year. It’s the most tax-favored asset in the United States. With potential deductions for depreciation of the property, upkeep and repairs as well as travel and home business expenses among many other things, owners of rental properties can claim expenses for every year they own the property. Gold and silver don’t depreciate, and upkeep is limited. The primary impact on investors in precious metals come tax time has to do with the dreaded capital gains tax. Realizing a profit on an investment pushes an investor into a higher tax bracket. And the amount of capital gains taxes owed depends on how long an investment is held. If you bought a quantity of gold and sold it for a profit in the same year, you’ll typically pay a higher amount of the already high capital gains tax, since that’s a short term investment. Hold it longer, and the tax liability goes down. But the income property investor who doesn’t sell – who holds the property for the life of a mortgage or more – won’t pay capital gains taxes at all. And if the property is eventually sold, it will most likely be taxed at the lower, long arm rate. That’s why house flipping – the strategy of buying cheap properties, doing a quick fix-up and then selling them fast – is like investing in gold. Profits are turned back into the next investment, and quick turnarounds bring higher taxes without opportunities for some deductions.